Corrupt Practices by Robert Rotstein, a Mysterious Review. 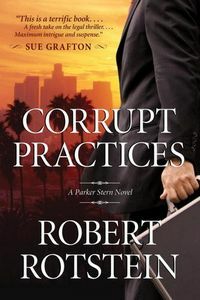 Review: Corrupt Practices by Robert Rotstein introduces Parker Stern, a very successful trial attorney until his good friend and mentor Harmon Cherry, a partner in the Macklin and Cherry Law Firm, committed suicide. After that Stern suffered from a phobia preventing him from practicing law, exhibiting symptoms of a a panic attack whenever he entered a courtroom. After Cherry's death, the law firm effectively dissolved. Associate Rex Baxter took the biggest client, The Church of the Sanctified Assembly, as his own. Deanna Poulos opened a coffeehouse while Manny Mason went on to become an associate dean at the St. Thomas School of Law. It is Mason that finally persuades Stern to return to the law, if only to teach a course in trial advocacy. Stern's class of only three students is interrupted by a call from Rex Baxter from jail asking Stern to represent him. Baxter has been accused of embezzling millions from his client, the church, of which he had become a member. Stern reluctantly agrees, and during his first meeting, Baxter tells him that Harmon Cherry did not commit suicide as everyone believed. Cherry was, in fact, murdered by someone connected with the church. Stern find this hard to believe but soon thereafter Baxter himself is found hanging in his cell, another apparent suicide. The church is now suing Baxter's only heir, his father, for the money allegedly stolen. Trying to shake off his phobia, Stern agrees to represent Baxter's father. With the help of his three students doing research about the church and its leaders, they begin to expose the hidden truths behind the misappropriation of the church's funds and the mysterious deaths of his friends. Corrupt Practices has an interesting, diverse cast of characters that provide this legal thriller with both interest and intrigue. The storyline is written in a manner that is simultaneously upbeat and unsettling, a combination that is quite effective in engaging the reader in Parker's case, which is satisfyingly complicated but not confusing. A good story and a terrific start to a series. Special thanks to guest reviewer Betty of The Betz Review for contributing her review of Corrupt Practices. Acknowledgment: Seventh Street Books provided a copy of Corrupt Practices for this review.